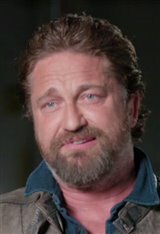 Born in Glasgow, Scotland, Gerard Butler spent his first few years in Montreal, Canada, before returning with his family to Scotland. After his parents divorced, he remained with his mother for most of his childhood, reconnecting with his father in his mid-teens. Gerard was enthralled with movies and acting when he was a child, and his mother even took him to a few auditions. He became a member of the Scottish Youth Theatre and played one of Fagin's boys in a production of the popular musical Oliver! with the company. Despite his love of performing, Gerard decided to settle on a career as a lawyer. He attended Glasgow University and was even president of the school's law society. After graduating with an Honours degree in Law, he took a year off to travel and wound up in California, where he enjoyed a life of partying and women. Finally returning to Scotland, he began working at a top law firm in Edinburgh, but he still yearned for the stage. His heart wasn't in law and his employers noticed. At age 25, he was fired. He moved to London, where he worked at a variety of odd jobs. He finally landed an audition for director/actor Steven Berkoff's stage production of Shakespeare's play Coriolanus. Gerard impressed the casting director, who gave him a small role in the ensemble of the production, which debuted at the Mermaid Theater on May 29, 1996. He was then cast in a lead role as Renton in the touring company of the stage play Trainspotting. He was thrilled, as he'd seen the play while working as a lawyer and had loved it. In 1997, Gerard made his film debut as Billy Connolly's younger brother in the movie Mrs. Brown (1997), which also starred Judi Dench. His movie career continued with small roles in the James Bond movie Tomorrow Never Dies (1997) and Tale of the Mummy (1998). He also landed a regular role on the short-lived comedy TV series The Young Person's Guide to Becoming a Rock Star in 1998, playing the role of Marty Claymore. When the 21st century hit, Gerard landed starring roles in the mini-series, Attila, playing the lead role; Wes Craven's feature film, Dracula 2000 (2000), playing Dracula; as well as roles in Reign of Fire (2002) and Lara Croft Tomb Raider: The Cradle of Life (2003). It was his role as the Phantom in The Phantom of the Opera (2004) that was Gerard's big breakthrough, however. As the lead, he had to perform extremely challenging songs and though he'd been the lead singer of a rock band, he had little vocal training. Nonetheless, he shone in the role, which paved the way for many more starring roles. In fact, he's become one of Hollywood's leading actors, equally adept at comedies such as The Ugly Truth (2009) and The Bounty Hunter (2010) as well as more dramatic fare, such as Law Abiding Citizen (2009) and the Sam Childers biopic Machine Gun Preacher (2011). He came full circle when he played Tullus Aufidius in the film version of the Shakespeare play Coriolanus (2012), opposite Ralph Fiennes in the title role. Gerard has also played a surfer in Chasing Mavericks (2012) and starred in London Has Fallen (2016), as well as in Gods of Egypt (2016). Most recently he returned to theaters action thriller Hunter Killer (2018) where he appeared alongside Gary Oldman. He is set to reprise his role as Mike Banning in the upcoming film Angel Has Fallen (2019), the third installment in the Olympus Has Fallen series. With homes in both New York and Los Angeles, Gerard spends his spare time playing football (soccer), horseback riding, skiing and water skiing. He's been romantically linked to a number of celebrities, but has remained single.